Leonore Ehn started acting at an early age. In 1910 she went to Berlin where she was engaged at the Schiller Theater. In 1915/1916 she worked in Hamburg and there she befriended her Austrian colleague Ida Orloff. She was a succesful actress until the nazis came to power. Her husband, the actor Hans von Zedlitz, was Jewish and in 1935 they left Germany for Austria and then Russia. After the Hitler-Stalin pact her husband was arrested by the Soviet authorities. They separately managed to return to Germany, but in Germany Von Zedlitz was arrested again. Shorty before the war he left Germany, but Leonore stayed behind to take care of their sons. In 1940 she appeared in the movie "Mädchen im Vorzimmer". After the war she was unsuccesful in her attempts to continue her theatrical career and in 1950 she left the stage. In 1948 Von Zedlitz had died in Switzerland. She died in Berlin in 1978 aged 89 and her grave at the Heerstrasse cemetery is a honorary grave of the City of Berlin. 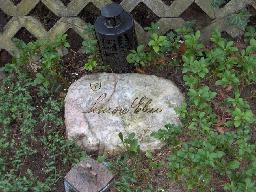 The grave of Leonore Ehn at the Friedhof Heerstrasse, Berlin.